A good friend just reminded me that Yorkshire Pudding should be near the top of my list of things to be thankful for. Sorry, Roz, it just slipped my mind. We enjoyed a wonderful meal which included Yorkshire Pudding at Elim Lodge on Sunday at noon. Delicious!!! 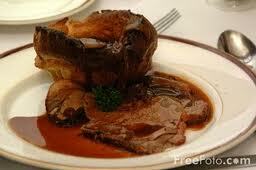 #6 - Yorkshire Pudding...best enjoyed with roast beef and gravy. Now you're talking...best enjoyed with a cold diet pepsi.